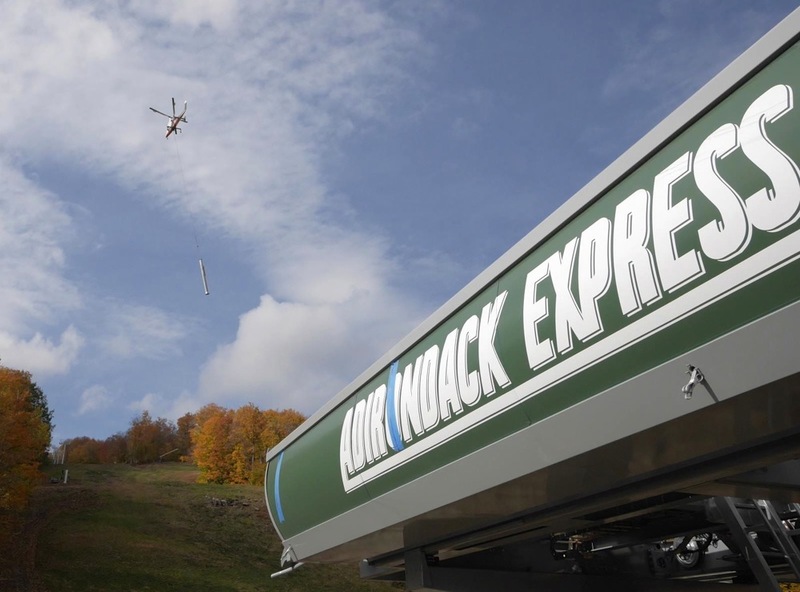 I’m fascinated by lifts and lift technology, so I was excited when GM Mike Pratt offered me the chance to visit Gore Mountain for an update on the new lift, the Adirondack Express 2. As we were driving into the parking lot, we saw all of the new lift parts lined up in the parking lot, ready to go. The new high speed quad is a bottom drive with the same configuration as the relatively new Burnt Ridge Quad. The motor is 700 horsepower and runs off of 480 volts. Max design speed for the new lift is 1100 feet per minute (fpm) like the Burnt Ridge Quad and Gondola. While it’s unlikely that it will be run at full speed, it will still be considerably faster than the old lift. The old Adirondack Express had a maximum speed of 885 fpm and was routinely run at 600-700 fpm. Mike told us the new lift will be run at 900 fpm, almost 50% faster than the old. The gondola is run around 900 fpm and the Burnt Ridge quad is usually at 1,000. Mike described some of the problems that led to the replacement of the old lift. The original Adironack Express was 30 years old and the design was no longer supported by the manufacturer. Repair often required fabricating custom replacement parts which is a costly, time-consuming process. The towers from the old lift were removed carefully allowing them to be reused in the future. The detachable parts were sold for scrap. The unloading area in the Saddle has been reconfigured. The new lift is 15 feet shorter, giving more space for the ramp. The terminal is also five feet lower, and six feet closer to the Saddle Lodge. Before this change the ramp had a sharp turn that was often slick. The new configuration makes the turn much more gradual meaning less ice, fewer accidents and fewer lift stoppages. As the top terminal is the return, the roof was already going up. This lift has tensioning at both terminals. Most of the tension will be applied at the bottom as it is more efficient to tension the lift from there. The tensioning at the top will be used for fine adjustments. The day of our visit was right before helicopter day. That heli-installation was expected to cost $25,000 and take about four hours of flight time. Showcase —the run beneath the lift — has been widened in a few spots on skiers left, placing the line more in the center of the trail. To widen the trail the snowmaking pipe, trees, stumps and rocks were removed from the section to be widened. Then the trail was regraded and reseeded for erosion control. 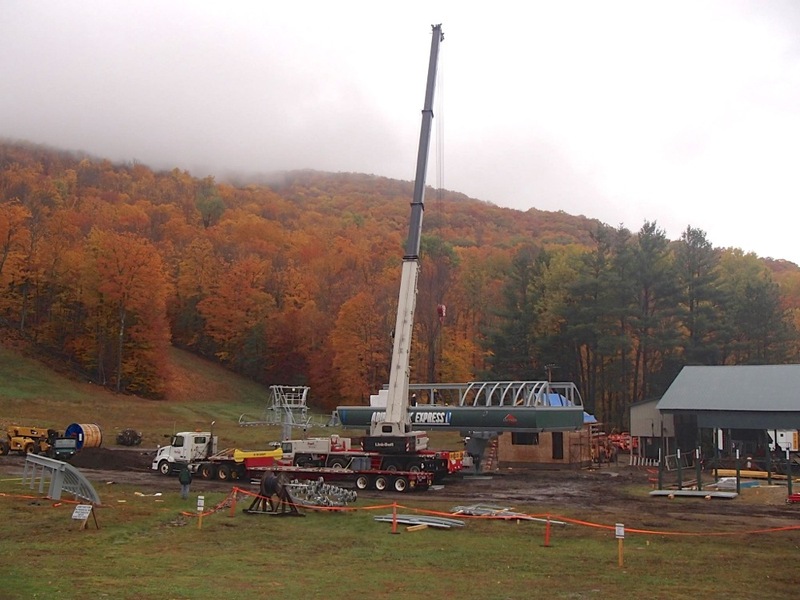 Finally, the snowmaking pipe is re-installed on the new edge of the trail. The East Side of Gore has several “steps” or short steep drops. On Showcase, some of these have been moderated producing a more constant pitch. The new lift has 8 fewer towers, creating a more wide open run. All of the old footings were jackhammered and the remains removed. This appeals to me for aethestic and safety reasons. The Adirondack Express 2 wasn’t the only improvement at Gore this summer. 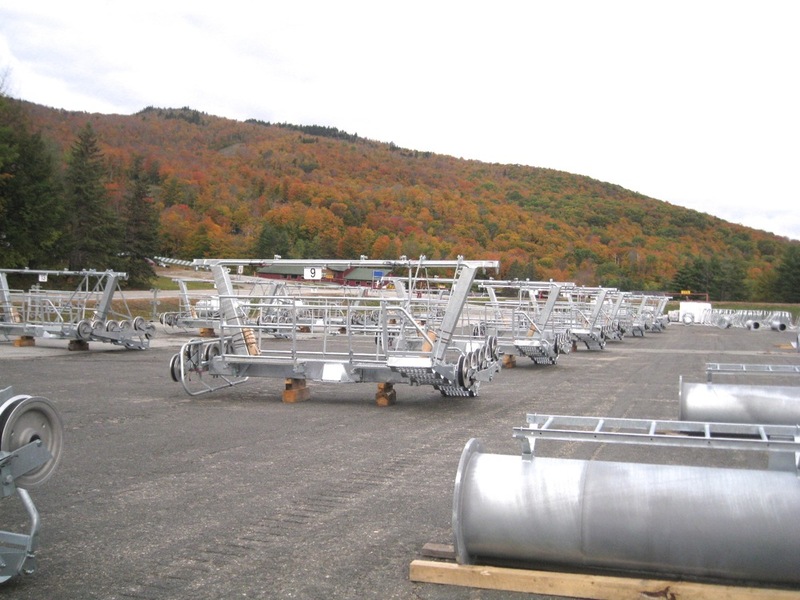 Topridge received 22 new snow guns. The new HKD Impulse towers will be more efficient using only 25% of the air used by the Ratnik ground guns that have been used in the past. There were also new snowmaking hookups added near the Pipeline Bridge which will improve connectivity to the Ski Bowl. 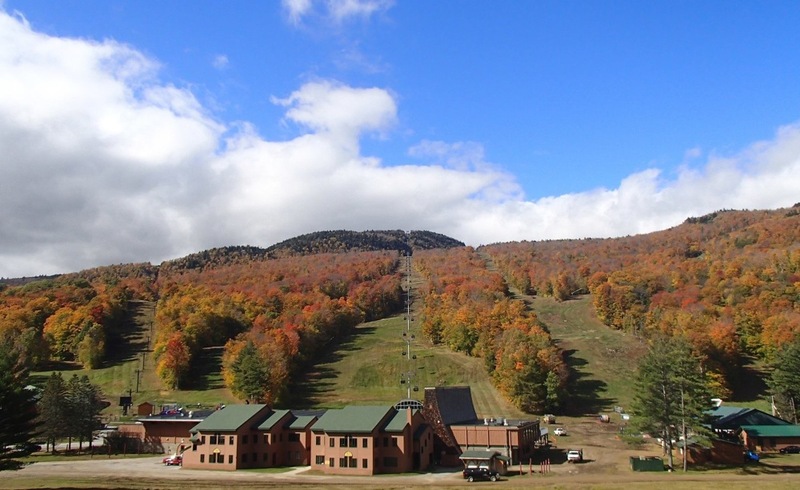 Looking ahead, Mike confirmed that the next major upgrade will be the replacement of the High Peaks Chair. It has not been decided what the new lift will be. The Sunway Chair will be replaced after that with a triple. Having a triple allows one instructor to ride with two beginners simplifying the lesson process. This triple may use some parts of the original Adirondack Express, so the old girl may live on, in some form, at Gore. I saw the lifting helo a couple of weeks ago- quite impressive! Heard the guy in chopper was really good, took only 3 hours- impressive! What’d Mikey say about the webcam progress? what a fall up there! I haven’t been to Gore yet, but I plan to go this year. It looks like a good time to go. Thanks for the post. Glad to hear that the “time to chill” at the top of the lift has been reduced! Snoloco, what did Mike say (if anything) about the energy efficiency of the new lift as compared to the old AE? I imagine there must be some decent kwh savings. I am pretty sure that the new lift is more efficient than the old. However, I did not ask Mike for the exact numbers. I might email him to find out though. Nice report . . . thanks for the update! I have to say that this fine mountain continues to get better and better with age. Nice story on the new lift and glad to hear about the expected future changes. I’ve always enjoyed skiing Gore and consider it my favorite local hill. I think the state does a pretty terrific job managing Gore and Whiteface. Both are exceptional places to ski and enjoy the beauty of the Adirondacks. I look forward to skiing both again this upcoming winter. May the snows fall from the heavens. When Gore management works on the plan for the High Peaks Chair, tell them to make it go the the TOP of the mountain. Shortening that chair was dumb and a waste of money. Nice article otherwise! Thanks for sharing the info!! !